Two Dreamworks Art books were released this month, and I happen to have artwork in both of them. MOONSHINE is a compilation of personal artwork from the Dreamworks Visual development artists. Pretty Awesome. I have a fun little spread in there. 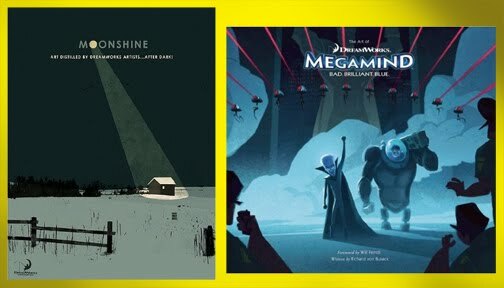 The ART of MEGAMIND was released as well. A slew of my early development work appears in the book. Below are some examples. Now on page 57 of the Art of Magamind book, there is a series of color Roxanne expressions that are all credited to me. But in fact I am only responsible for the girl in the gray tank top with the sunglasses on her head. Shannon Tindle did all the others. Mis-credits happen in every art of book, so Its good we have blogs.